Ananka's Diary: Groundhog Tries to Eat New York's Mayor! THIS IS WHY I DON'T TRUST GROUNDHOGS! As you may recall from last year's Groundhog Day post, I consider groundhogs to be nothing more than evil, overgrown squirrels. Now I have proof. 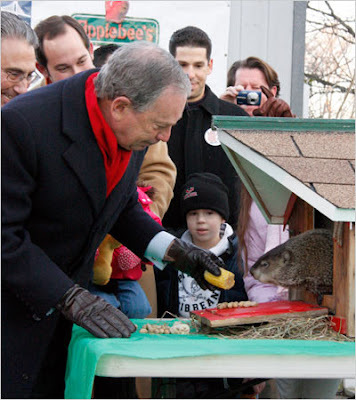 Yesterday, New York's dear Mayor Bloomberg paid a visit to Staten Island Chuck (aka: Charles G. Hogg), the city's own weather-predicting rodent. But instead of offering his forecast and allowing the mayor to go his merry way, the nasty little fur ball decided to have a taste of hizzoner. After the attack, Mayor Bloomberg was seen sporting a bandage on one finger. But all he would say to the terrified reporters was, “Given the heightened response against terrorism, and clearly in this case a terrorist rodent who could very well have been trained by Al Qaeda in Afghanistan, I’m not at liberty to say any more." Yummy. Roasted NY mayor! JK. Evil disugised as cute in innocent. There's going to be winter where I live no matter what, so I don't care if he sees his shadow or not. Yeah, in MT we always have winter for like a MONTH longer than everyone else. And that groundhog sort of reminds me of my friend's hamster, who will bite her so hard she drops him and then he runs away and hides somewhere. You know, I never thought of it before, but now that I think of it, Groundhogs really do have the power to rule the world! They're cute but evil, people trust their judgement, and apparently they are fearless, as the NYC one tried to eat the mayor. So here's a message to Obama: Keep a special eye on groundhogs. They might become terrorists. its crazy we haven't got much snow in years but this year we have had tons for us and lots of cold weather. the wind chill is in the negatives (farenheit)! Your mayor has a sense of humor! Kool! Please tell me if anybody else has watched it! I totally love it!! “He was basically concentrating on his food,” Ms. Montalvo said. “The mayor’s fingers may have just been there. He wasn’t necessarily going for the mayor.” That's what you think. The groundhog had no comment. It's about -5 inches here. Groundhogs. Are. Evil. One of these days they'll take over the world.